Novi Most International, the organisation we volunteer for in Bosnia and Herzegovina, has a challenge it gives its team members. It's called "How Dare We?" To a team that has committed to help work for a better future for young people growing up in this country the challenge is how dare we dream dreams for them we are not dreaming for ourselves. 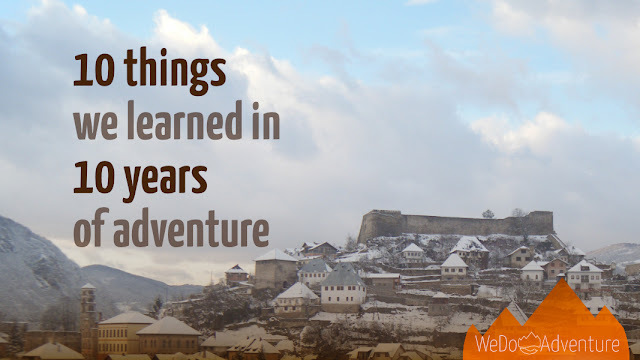 Over the past two years our work in Jajce has allowed us to introduce dozens of young people to experiences they've never had before. It's exciting to make a first trip to the cinema possible, or the first visit to a nearby city, or a first ride up an escalator. But "How Dare We" makes me ask what new experiences I've had recently. I like it. It stops you from standing still. The person who has stopped exploring will likely soon stop encouraging others to do so. So we explore. This January I was in the same boat as the young people we took to a winter camp on Jahorina, one of the Olympic mountains outside Sarajevo: we were all trying snowboarding for the first time. The only difference between us was I'd wanted to try it for longer than most of them had been alive! Inspired, I bought a snowboard at the tail end of last winter and started to put some practice in. As this winter starts I am turning my hand to snowboard tuning. Search YouTube for long enough and you find decent tutorials on almost anything. Tonight I'm typing this blog at the halfway point of waxing a base for the first time. You need about half an hour between applying hot wax and scraping off cold wax. That time is up and I must get back to work. The process of learning news skills to be passed on must continue.